I would like to introduce you this week to a very nice on-line casino, that I enjoy playing day after day. It's extremely important to be able to trust the fairness and honesty of an on-line casino and after having won so many sessions, this casino is becoming one of my favorites. It is the Global Player Casino and we'll see now why I like them so much. You know I'm a Roulette enthusiast. Many people wouldn't play Roulette because of the high house advantage (5.26%), or they would prefer other table games where the odds are lower such as Craps or Baccarat. But in Global Player Casino, not only they have French Roulette with single zero, which already reduces the house odds to 2.63%, but they also have the "La Partage" rule, with which you get to keep half of your bet value on an even bet such as on Red/Black, High/Low and Even/Odd when the zero shows up. This reduces the house edge by another half to 1.315%. When the La Partage rule applies, the famous "James Bond" bet is not a wise bet: In "Casino Royale" Bond declares his favorite bet to be a wager of 100,000 francs on both the first and second dozen. This bet covers the numbers 1 to 24 and pays 100,000 francs. If, however, the zero wins, Bond loses all his money. The more sensible bet would be to place 150,000 francs on the low numbers 1-18 and 50,000 francs on the six numbers 19-24. This bet wins exactly the same amount as Bond's original bet, but if the zero wins, he would keep 75,000 francs of his even-money bet on 1-18 instead of losing all 200,000 francs. You will also love the game interface and the highly advanced graphics. With the beautifully animated roulette wheel, the sound effects, the croupier voice, announce window, etc. you will feel in a real casino. In order to participate in the Blackjack Tournament, all you will need is your Global Player account. Friday, August the 29th, at 19:00 EDT. The final will be held directly after the semi-final. The top five ranked players in the Qualifying round will be given an additional $100 bonus and will compete against each other in a multi-player match. Final balances will be added to each competitors account. The winner will receive the premium prize: US$4,000 in cash. Start Money Minimum Start Money is US$50, winnings can be kept and cashed out. Additional deposits are allowed, players can deposit as much as they want. How to Play: Start the software, log in, and select Blackjack. During the qualification period there are special single player tournament tables named Gamemaster Tournament, 6 decks (available as $1, $5 and $10, Atlantic City rules). Start to play! No registration required. A minimum of 50 rounds is required for a valid attempt. Winner Calculation: The ranking will be based on the win percentage. Win percentage is winnings in proportion to the deposits (start money + additional deposits). Check the Leaderboard for the current rankings. Updated in realtime! Multi-Player Semi-Final: Following a very successful series of Blackjack Tournaments, Global-Player once again takes another step to improving this monthly event by introducing a Multi-Player Semi-Final. The top five ranked players in the Qualifying round will compete against each other. The best of the best will join the Gamemaster in a head to head match. This means you might win twice - in qualifying round and final. At least three contestants will be awarded a prize. The Global-Player Casino offers a variety of 23 Video Poker machines, with different coin values and different types, with or without wild cards and progressive jackpots! Most of them with a payout percentage around 99%! Did you ever see more Video Poker games in one online casino? As a guest, you are provided with $1,000 in demo money when you enter the casino and you can play any of the games listed in the selection window. As a real player, you are given a bonus of $30. You will receive your $30US on the house as soon as your initial deposit(s) are at least $30US or more. For example you may deposit $10US three times and after the third deposit you will be awarded your bonus. To give the multi player games an additional touch of reality, players who are sitting together at a multi player table can chat with one another. Global-Player Casino offers multi player roulette and blackjack tables where players can play and chat together just like in a real casino. Multi player games give you the real casino feeling not only because you will play in real time, but also because you can watch the other players placing their bets and receiving their winnings. However, if you prefer less action and a game that you can play at your own pace, they also provide single player games. Blackjack is a quite simple and straightforward game. However, over the years, certain variations to the rules of the game have evolved. Global-Player Casino offers you a representative selection of blackjack rule variations from casinos around the world. Expert players will note that they have refrained from including features that put the player at a significant disadvantage, such as "dealer's blackjack always wins" or "dealer wins ties". Double down is allowed on any total of the first two cards. No doubling is allowed after splitting cards. Dealer stands on soft 17. Only three splits are allowed i.e. making a total of four hands. Surrendering initial hands is allowed. Double down is allowed on any total of the first two cards. No doubling is allowed after splitting cards. Dealer hits on soft 17. Splits allowed up to 4 hands, Aces may be resplit. Surrendering is allowed. The deck is shuffled after each round. Double down is allowed on any two cards. Doubling is allowed after a split. The dealer must stand on soft 17. Splits only up to 2 hands. Surrender is allowed. Double down is allowed only if the two first cards have a hard count of 10 or 11. No double after split. Dealer hits on soft 17. Splits up to 2 hands, surrender is not allowed. The deck is shuffled after each round. Double down is allowed if the first two cards have a count of 9, 10 or 11. No double after split. Dealer stands on soft 17. Splits only up to 2 hands. Only cards with the same face value may be split, e.g. a Queen only with another Queen, not with a Jack. No surrender is allowed. Dealer's blackjack wins all bets including splits and doubles. An unbusted player hand with six cards automatically wins over any dealer hand. Double exposure is a blackjack variation in which both dealer cards are exposed. Double down is allowed only if the two first cards have a hard count of 9, 10 or 11. Dealer hits on soft 17. Splits up to 4 hands. Surrender and insurance are not available. Blackjack pays 1:1. Player wins Blackjack ties, dealer wins all other ties. The decks are shuffled after each round. A five-card 21 pays 3:2, a six-card 21 pays 2:1 and a seven-card 21 pays 3:1. Finally, if a player has three suited 7s and the dealer also shows a 7 of the same suit, the player wins a jackpot of $1,000. To balance all these advantages, all 10's are removed from the card decks. This game is played with 6 decks. Random events are the real basis for every game of chance. The players bet on the outcome of a game which cannot be predicted because the result is random and does not follow any rules or algorithms. At first sight, a series of random numbers has no particular set of properties - they are just numbers. Sometimes a number or a couple of numbers are repeated, most of the time they are not. It is actually impossible to prove a sequence of numbers to be random. One can just test it for un-randomness and if a test succeeds, the sequence is proven not to be random. For a casino, be it traditional or a virtual casino like Global-Player, it is absolutely essential that the outcome of the games are unpredictable. In traditional casinos, there are various ways to assure the unpredictability of results, and each casino game uses a different method: the physical randomness of the roulette wheel, the untraceable shuffling of cards, etc. But what kind of a random number generator can produce truly random numbers for an internet casino? Obviously, it cannot be a roulette wheel. Global-Player Casino uses hardware devices based on the quantum mechanical uncertainty of tunneling electrons, which is, in its principle, unpredictable and thus yields really random results. Each time you place a real money wager at the Global-Player Casino, you will receive Comp Points, no matter if your bet has won or lost. When you collect enough Comp Points, they will be automatically converted to bonus chips. It is not always good to be a forerunner. This is particularly true in the computer age. Global-Player Casino goes online at a time when the Internet and everything related to it is no longer in a trial phase but is turning into a mature technology. This allows them to surpass the quality of what others have done before them. By taking advantage of new and evolving possibilities, they are simply better. This goes for their service, their staff, their security standard and, last but not least, for the quality of their software. They are one of the finest Internet Casinos around. They are approved by the Internet Gaming Commission. They are approved by the Gambling Commission. They are approved by the Online Players Association. They are an affiliate of the AnteUp listing of links to gambling related websites. 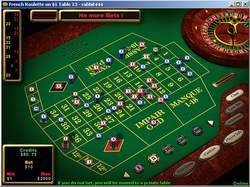 It is important to note that their Roulette limits are far higher than anywhere else in the Internet. When I entered the $1 minimum Roueltte table, the maximum was set to $1000. When I entered the $10 minimum table, the maximum was set to $4000. Nothing stops you also from navigating from a low minimum to a high maximum table expanding your range from $1 to $4000. Note only that the outside bets are $5 minimum, which still gives you a wide range, if you happen to use progressions. At Global-Player Casino, you can even find archives of the last 5 year's Roulette spin results. You can download them and use them in your tests and simulations. It's really a very nice on-line casino. I won 63 sessions there in the last 3 days, using my very simple betting selection from the KISS system used for Roulette and a very mild progression used in Superior Roulette playing on the French wheel. Go and check them out yourselves. I'm sure you will like them a lot. Click here to open an account at Global-Player casino. You can select the language of your choice by clicking on the appropriate flag. While filling the registration from, when you're asked for the referring Nickname, enter: gpcwinner.